The search is continuing for three terror suspects, believed to want to kill UK troops abroad, who went missing while subject to control orders. Home Secretary John Reid said they were not a "direct threat" to people in the UK but added they were dangerous. Earlier, security watchdog Lord Carlile said there was "solid evidence" the men had wanted to join insurgents abroad. Lamine Adam, 26, his brother Ibrahim, 20, and Cerie Bullivant, 24, failed to report to police earlier this week. The Adams' brother, Anthony Garcia, is serving life for plotting explosions. 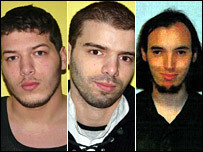 Garcia was one of five men jailed last month over a plot to target the UK with a giant fertiliser bomb. During the trial, the Old Bailey heard that the plot's ringleader asked Lamine Adam and Garcia to buy the key bomb ingredient because their fairer skin would arouse less suspicion. Mr Adam knew many of the key conspirators in that case, but was not prosecuted as part of the investigation. Bullivant had previously appeared at the Old Bailey for breaching his control order. Listed as "AG", he appeared at the Old Bailey on 2 and 16 April this year on charges of breaching 13 conditions of his control order. He was next due to appear on 29 May. Mr Reid told the House of Commons the security services did not assess the three individuals as presenting a direct threat to people in the UK. But he added: "They are dangerous and we can take nothing for granted." In a written statement released earlier Mr Reid said the orders had been designed to stop the men travelling overseas because it was believed they wanted to leave the country for "terrorism-related purposes". He said they had been required to surrender travel documents and report to a police station every day, but had failed to turn up on Tuesday. Two of the men were due to telephone a monitoring company on Monday evening, when it is believed they absconded, but failed to do so. Metropolitan Police Commissioner Sir Ian Blair appeared to contradict Mr Reid when he said in a statement there was no guarantee the men did not pose a threat to the UK. Six people have absconded from control orders since the system began in 2005. The Home Office said 17 people were currently subject to the restrictions. Legislation under the Prevention of Terrorism Act enables control orders - a type of house arrest - to be placed on those suspected of links to international terrorism. Lord Carlile, a Liberal Democrat peer, told the BBC: "These three men were the subject of solid intelligence that they intended, not to cause damage in the UK, but that they intended to damage our national security by going as insurgents to kill British and other allied troops abroad, in Iraq for example. "So it was decided in accordance with human rights laws to have the lightest controls that seemed compatible with the necessity of the occasion." He questioned whether the men should have been subject to tighter restrictions, but said: "The courts are very strict in controlling the controls placed upon people subject to the orders." The Adams' brother, Anthony Garcia, was one of five men jailed for life last month for his role in a plot to target the UK with a giant fertiliser bomb. The alert went up when the brothers did not contact a monitoring company on Monday evening. Cerie Bullivant is understood to have been missing since Tuesday morning when he failed to report to his local police station. The Conservatives have accused the government of failing to protect the public. Shadow home secretary David Davis said: "John Reid's primary responsibility is the protection of the public. This consistent yet gravely dangerous failure to carry out that duty continues to threaten the safety of the public." Lib Dem home affairs spokesman Nick Clegg said a hammer blow had been delivered to the idea of control orders. He called for a review of the "increasingly discredited" system. Police described Lamine Adam as of north African origin, 6ft, slim, with a light complexion, short dark brown hair and last seen with a short beard. 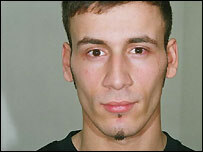 Ibrahim Adam is also of north African origin, 6ft 2in, slim with a light complexion and short dark brown hair. They said Cerie Bullivant was white, 5ft 7in, slim with receding brown hair and brown eyes. It is understood he recently cut his hair very short. People with any information are asked to call the confidential anti-terrorist hotline on 0800 789 321.